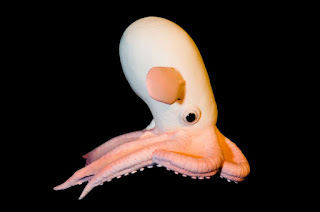 Grimpoteuthis is a genus of pelagic umbrella octopuses known as the dumbo octopuses. The name "dumbo" originates from their resemblance to the title character of Disney's 1941 film Dumbo, having a prominent ear-like fin which extends from the mantle above each eye. There are 13 species recognized in the genus. The genus has a distinct habit of swimming. They flap their ear-like fins to propel themselves. Movement of the arms can be used to help the animal move in any direction. The arms permit the animal to crawl along the seafloor, to capture prey, lay eggs, explore, etc. Dumbos hover above the sea floor, searching for polychaete worms, pelagic copepods, isopods, amphipods, and other crustaceans for food. Prey is captured by pouncing on the target, which then is swallowed whole. Females have no distinct period for breeding. Females carry multiple eggs in various stages of maturation, suggesting that they have no optimal breeding period. Male octopuses have a separate protuberance on one of their arms that carries an encapsulated sperm packet to the female. It is hypothesized that the female can then distribute this sperm to the eggs at any given time based on environmental conditions. The females lay the eggs under small rocks or on shells in the deep ocean or can even carry them on her arms, by tucking the eggs behind the wide webbing, until she finds a safe place that would provide them with the best fitness. As with other octopuses, females do not invest any further time in the young after they hatch because once they are born they are able to defend themselves.